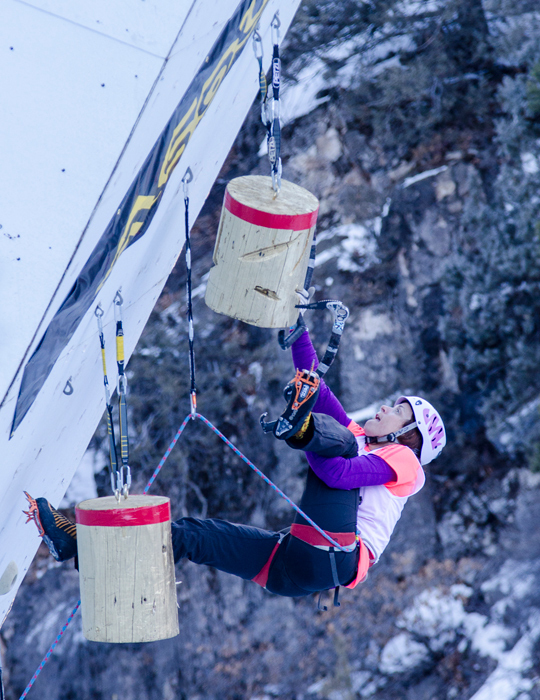 Several thousand people swung tools, belayed and milled around the Ouray Ice Park in southwest Colorado yesterday, but only 24 of them had hopes of eviscerating a paper-mache bull to make its Cheese-Ball innards fall out. 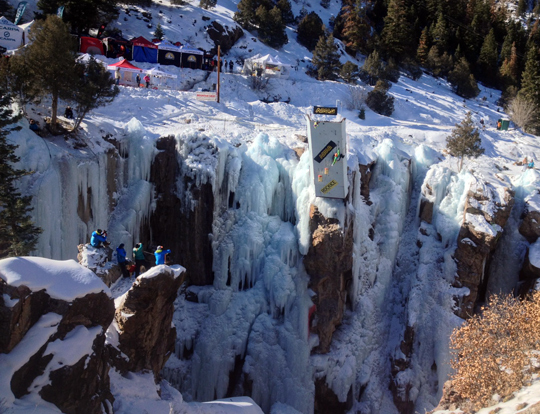 A mandatory lunge for the pi�ata marked the finale of the Elite Mixed Ice Competition route at the Ouray Ice Festival this year. 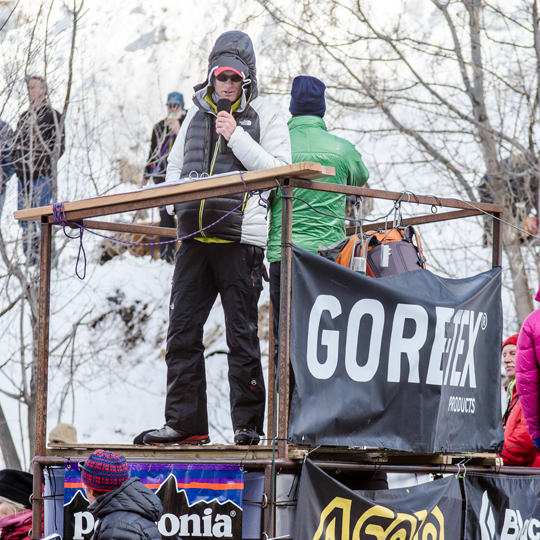 Of two dozen competitors (17 men, 7 women), just three climbers reached the pi�ata, and only the final competitor, Jeff Mercier, did it in less than 11.5 minutes to win. Penultimate competitor Stephanie Maureau took the women's division, reaching the highest point of her peers in the fastest time. Local Vince Anderson set the competition route this year for his seventh time. Gold Digger, named in reference to the town of Ouray's gold mining origins, follows a mixed line in the Scottish Gullies area called Mighty Aphrodite (M9), but with an additional, three-sided tower mounted at a 30-degree overhang. One plastic ice hold and a rectangle of foam set climbers up for the crux of the route: three hanging logs, each colored as "gold nuggets." Transferring from the highest nugget onto a second set of plastic and foam holds set competitors to "top out" by leaping off the wall to tag the multicolored pi�ata. The original Mighty Aphrodite was first climbed, with an R/X rating, on pre-placed traditional gear by British climber Lucy Creamer. 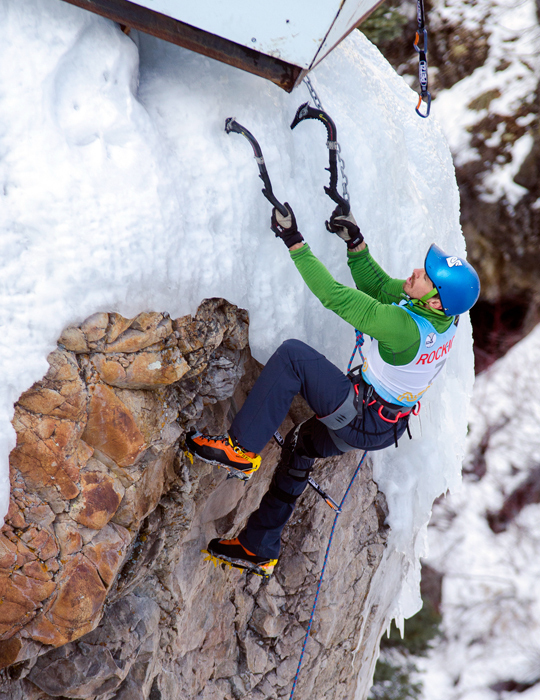 After the route was bolted with her permission, local climber and competitor this year Andres Marin redpointed the climb on gear in 2010. A Birdbeak, micronut and a couple Aliens made up the scant protection between the Colombian and a ledge below as he pulled over the icy lip of the canyon to finish that ascent. 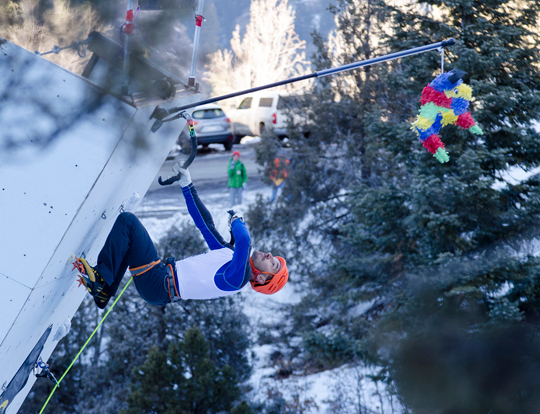 This year, Kyle Dempster was first to try the competition route, and worked quickly through the WI3 start and ice-less overhang that makes up the bulk of the route. After hacking out a few chunks of brittle ice from the ice bulge below the tower, Dempster fell on what would become the crux for most climbers: transitioning from one gold nugget to the next. Though the ice softened and pick holes formed as the morning progressed, no climber reached the pi�ata. 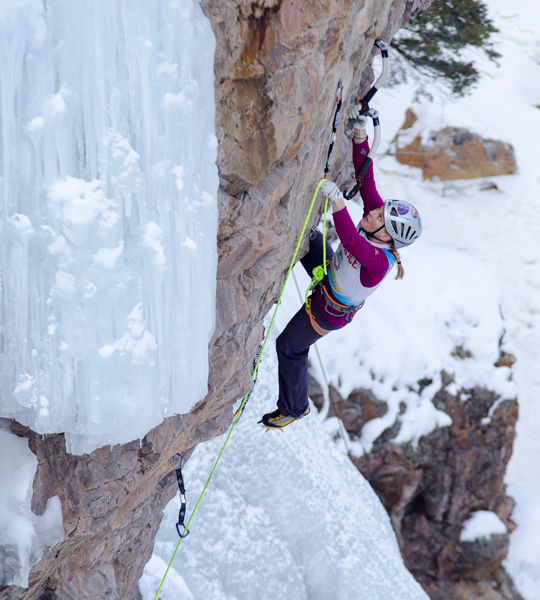 Because the bulk of the competition route this year followed natural features rather than man-made props, local climbers and Ouray veterans familiar with Mighty Aphrodite had an advantage over some visiting competitors. Jen Olson, Dawn Glanc and Andres Marin moved with particular confidence through the technical drytooling, hinging off an arete on the right while others muscled through a bulge to the left. Olson, who will represent Canada at the ice climbing demonstration in the Sochi Olympics this year, made quick, dynamic movements with a strong upper body that counteracted a few slips by her feet. Halfway through the allotted 12 minutes, she had already overcome the upper ice bulge and was sizing up the man-made tower. Soon after, she set the highpoint of the day, dangling in a leg-over-arm figure-four rest on the middle gold nugget before peeling off. Glanc moved slower through the rock overhang and had only two minutes on the clock when she fell from the lowest nugget. Hers was the first of several tools that ended up in the creek below. Before descending into the gorge, Marin promised the crowd, "I'm gonna get the pi�ata and take a thirty-footer!" Well acquainted with the lower route, he speedily hooked his way up and hardly paused before gaining the ice bulge at the lip of the gorge. An unusual heel hook let Marin ease onto the first gold nugget. He swung his tool into the second nugget, leaving it there to reposition his body and pointing at the lone axe, commanding it to stay. Shortly after, he dropped one of his tools in the creek and threw up his arm with an unmistakable, "Now what?" Despite considerable efforts to support his weight with his legs and move to the next gold nugget, Marin plummeted. For those who made it that high, the transition from nugget to nugget continued to thwart competitors until Italian Mauro Dorigatti stepped up. He avoided the excessive figure-fours and nines that had tired his peers by leveraging off one nugget with his foot to get a hard stick in a foam block on the far side of the tower. With two minutes left, he used the nuggets again as footholds to gain the final plastic ice hold and lunge for the pi�ata. "Now we know it goes!" said commentator Conrad Anker. Veteran Ouray competitor Will Mayo followed Dorigatti's success with a triumphant pi�ata leap of his own, pulling the paper-mache bull down with him. He finished the climb just a half second slower than the Italian. The competition wasn't decided until the final two competitors: French climbers Stephanie Maureau and 2008 Ouray winner Jeff Mercier. 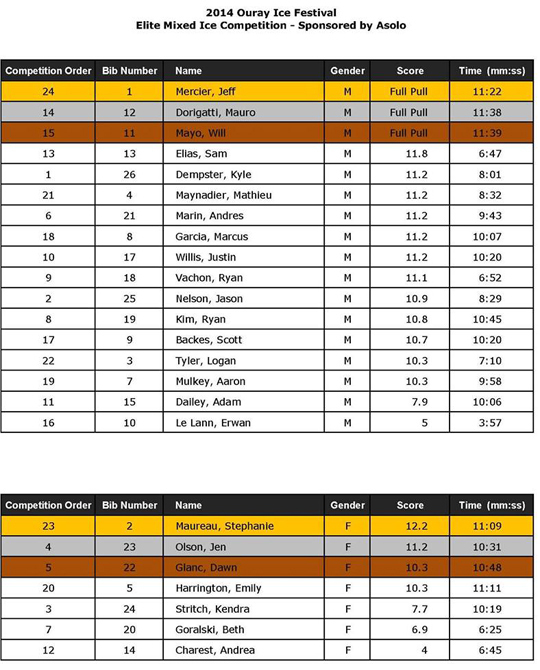 With four minutes left on the clock, Maureau moved onto the first gold nugget, took another two minutes to gain the second and fell going for the third with one minute left, but securing her win in the women's division. Halfway through his allotted time, Mercier was already swinging for the middle nugget, and with 38 seconds left on the clock, he made his wild leap for the pi�ata. Despite, I suspect, a collective inner disappointment having never seen Cheese Balls fall from a gouged pi�ata, the crowd yelled and screamed for their winner as he took his victorious fall.